A couple movies in to an old farm house only to find it isn't just a fixer-upper, it's haunted, in WE ARE STILL HERE. Paul and Anne Sacchetti (Andrew Sensenig and Barbara Crampton) hope that a change of scenery will help them get over the grief of losing their teenage son, Bobby. But almost immediately, Anne senses a presence in the home that she's certain is the spirit of her son. There are other strange phenomenon as well, like the unnaturally hot basement. Paul is skeptical, but after the contractor he hires to check out the basement suffers mysterious injuries, he isn't so sure. Then one night the Sachetti's neighbors Dave (Monte Markham) and Maddie (Susan Gibney) stop by to cheerfully inform them about their new home's history as a funeral parlor where the bodies didn't always make it into the ground. He goes on to explain that the owners at the time, the Dagmar family, were run out of town on a rail. Or were they? By this point, it's beginning to look as if the Dagmars are still present in the house in one form or another, and they aren't particularly happy to be sharing it. So Anne calls up her old friend May (Lisa Marie), a psychic, to ask if she could come visit and do whatever mumbo jumbo it is psychics do in a case like this. May brings along her husband Jacob (Larry Fessenden), and their son Harry (Michael Patrick) drives up separately with his girlfriend Daniella (Kelsea Dakota) so that there will be a few more potential victims on hand when the supernatural violence kicks into high gear. It's good to see Ms. Crampton, star of 80s horror classics HERBERT WEST: RE-ANIMATOR and FROM BEYOND, in a leading role once again. Her Anne is brittle but also resilient, recovering from the tragic loss of her son but still capable of asserting herself. Larry Fessenden is also no stranger to horror fans, having produced, written and directed some of the most interesting independent horror films of the last eighteen years (HABIT, WENDIGO, THE LAST WINTER). He also does a lot of small acting jobs for like-minded filmmakers, but here he gets a chance to tackle a meatier role, creating a memorable stoner who avoids most of the usual pothead cliches. The rest of the cast are fine as well, notably Markham who is the kind of constantly working character actor (over 100 credits on imdb since 1966) who makes an impression no matter how big or small the part. He has a slightly old school approach to acting which works well with the tone of the film. 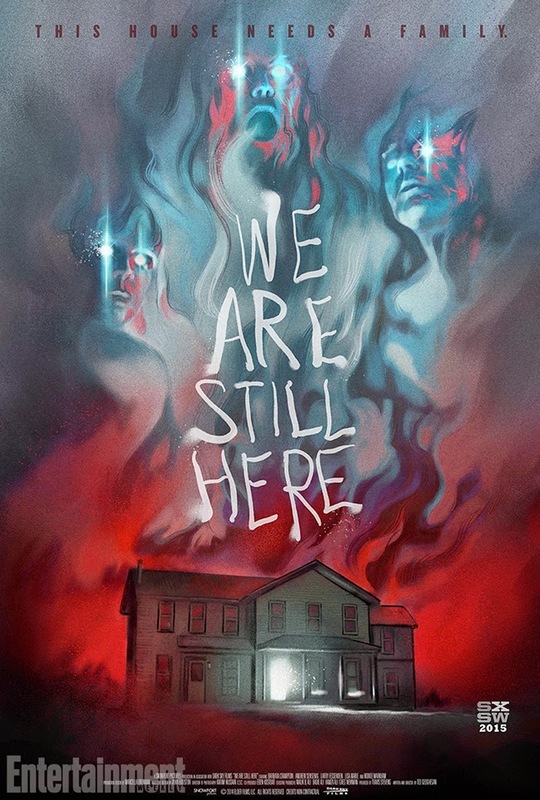 WE ARE STILL HERE draws a fair amount of influence from late seventies/early eighties horror films, notably Lucio Fulci's HOUSE BY THE CEMETERY which features a similar “undead menace in the basement”. Further showing Fulci's influence, writer/director Ted Geoghegan does a good job creating an atmosphere of supernatural dread and small town terror. I do wish the film had been a little more visually stylish, though, particularly in its scenes of violence. There's one nicely staged kill in a moving car, but even that feels as though it's shot a bit too straight forward, and cuts away too soon. I'm not saying Geoghegan should have lovingly lingered on the gore like Fulci would have, but I'm not saying that would have been a bad idea, either. And while I appreciate that the film takes time to build tension, the climax falls just a bit short of fully satisfying. Still, I always appreciate a horror film that isn't embarrassed about trying to be creepy. There's no tongue in cheek, self-deprecating humor here, nor any concessions to action movie tropes ala pseudo horror films like UNDERWORLD; WE ARE STILL HERE is just a good old fashioned spook show, and horror fans can always use more of those. 3 out of 4 stars.